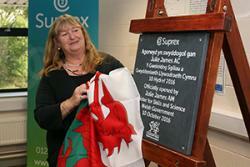 Julie Jones AM, Minister for Skills & Science opens Suprex Ltd.Julie James, Minister for Skills and Science officially opened Suprex, a cutting-edge technology company and joint venture between Bangor University and Phytovation Ltd recently (Monday 10th October). Suprex is a contract research organisation and the only commercial organisation in the UK able to develop process applications for carbon dioxide (CO2). Based in Caernarfon, Suprex is a spin-out from Bangor University and is a joint venture between Phytovation Ltd an established Pharmaceutical manufacturer based in Caernarfon and the University. The company was formed from the CO2 Lab which was part of the BioComposites Centre at the University. This grew from small beginnings in 2010 under the leadership of Professor Ray Marriott of the BioComposites Centre, to become the preeminent centre for research into the use of Supercritical carbon dioxide in the UK. 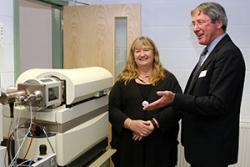 The expansion of the lab was supported by the Welsh Government with a grant of £345,000 in 2012 in recognition of the contribution that the technology could make in the development of industrial scale replacements for traditional solvents with an environmentally benign alternative. Suprex uses a cutting edge method of processing which is greener and more environmentally friendly than traditional methods. The process has applications across a wide range of industries including flavours, fragrances, cosmetics, personal care, nutraceuticals and pharmaceuticals. It is the only organisation in the UK capable of doing this type of research work. Andy Beggin, Chief Executive of Suprex showed the Minister some of the facility's high-tech equipment.The company currently works with a number of universities in the UK, as well as a broad range of blue chip businesses and SMEs and are actively working on new collaborative projects. “Suprex is a great example of early government support in an area of economic importance, leading to the creation of a self-sustaining business which in turn creates high-skilled jobs in the community. “I am proud we have been an active part of this academic and industrial collaboration, showcasing Wales as an innovative nation. “We will continue to build on foundations as set down in Science for Wales, and our Innovation Strategy and we remain resolute in making Wales the best possible environment for innovation and business growth. “Our company has the most versatile small scale CO2 process plant in the UK together with first class analytical facilities for the development of green and sustainable chemistry into new products and processes. We are working with commercial companies and academic groups to bring these developments to the market.